It is a great pleasure for me in the name of the Passionist Community to welcome you to the web page of St. Ann's Shrine Basilica. St. Ann's has been a beacon of light and a place prayer, reconciliation and solidarity for well over 90 years. This place of pilgrimage is primarily a place of prayer. St. Ann's is destination for countless people who pray for their families, their own intentions and for the needs of others. This is also a place of reconciliation where Passionists celebrate with God's people the great gift of the Sacrament of Reconciliation (Confession) as a tangible sign of God's desire to have us reconciled to him and to one another. ; Six days a week you can find numerous people coming to St. Ann's specifically to celebrate this great sacrament of healing and peace. St. Ann's is also a place of solidarity. People come from all walks of life to this Shrine and when they see others praying the stations, participating in the celebration of the Eucharist, the Monday and Solemn Novenas, or lighting a candle at the grotto or in the lower Basilica, they have a sense of belonging and communion with others. This house of prayer is made holy by the faith of those who come here faithfully to seek the Lord's peace and strength to live their faith. 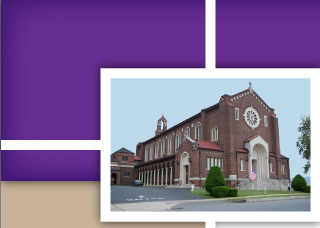 It is our hope that on this web page you will find the information you need to learn more about St. Ann's. You will find a video tour of the Basilica, Monday Novena prayers, the Stations of the Cross, the profiles of the Passionists of St. Ann's, prayer requests and many other features. It is our hope that this web page will keep you connected to St. Ann's and feel a part of this great place of pilgrimage. Through the intercession of St. Ann may God bless you in every way. Very Rev. Richard Burke, C.P.